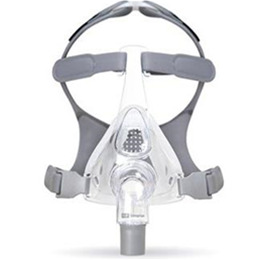 The design of the Fisher & Paykel Simplus Full Face CPAP mask minimizes weight and complexity for full face mask users. This full face mask delivers the air flow to both the nose and mouth for those whose mouth drops open during sleep. As the name suggests, the RollFit Seal rolls on the nose and allows the cushion to shift but still maintain a seal. This feature results in less stress on the bridge of the nose. A one-click design makes for easy removal and placement of the cushion on the mask. There are three sizes of cushion available: Small, Medium and Large.